In the Options dialog, the user may set some global parameters for the Office-QB application as a whole. There are two tabs in this dialog (see Figure 10 and 11 for more details). The Query Timeout parameter controls the timeout delay interval for a query execution. That is, if a query takes a longer time then specified to return records, then Office-QB will stop the execution and report a query timeout expire error message. For most purposes a value of 120 seconds is enough time to execute queries with millions of records. The Editable query results check-box controls the edit capability of Office-QB in the Result tab-view. To be able to edit the result of queries you must have this check-box checked. 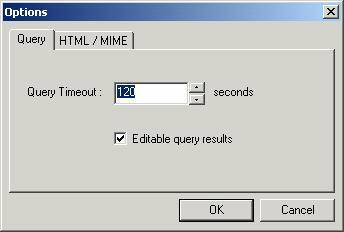 The Include description section check-box of the HTML/MIME tab controls the inclusion of an empty Description section in the HTML output. This is specially useful in the case of e-mail output, where the user may enter some comments about the query result. The Include SQL command text check-box controls the inclusion of the SQL command text for the query, above the query result output. 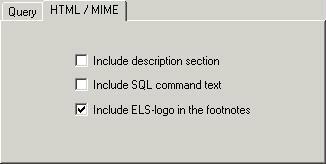 The Include ELS-logo in the footnotes check-box controls the inclusion of the Office-QB logo as a footnote at the bottom of the query result output.